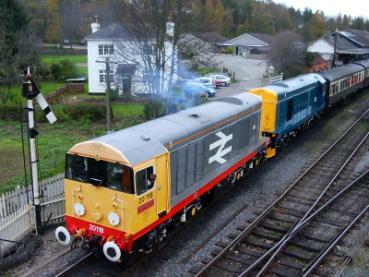 31st October and the loco was taken out of the P.L.O.G. shed in it’s new livery. This only needed touching up around the bogies to finish it off. It was also out shopped with a new colour scheme to the cooling fan! Later in the afternoon the loco was started so a check could be done on the new blower motor brushes. All found to be ok. Friday the 5th November saw a trip to Bishops Bridge for shunting, one of the cab side sliding windows broke (without anyone in the cab!). A temporary one was made from a piece of Perspex. 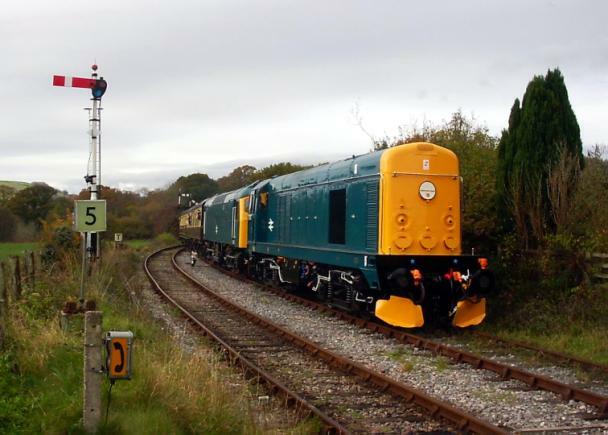 The loco worked the gala weekend, 6th & 7th November without fault. On the Sunday it was put in multiple with 20118 for the afternoon & evening, working the last train back from Totnes in the dark. It did a short spell on shunt releasing at the start of December. On Sunday 19th a trip to Bishops Bridge was made to pick up the Dining train that was left in the loop over night. This made the mileage for the year about 400 miles. On Sunday 17th October an air valve under the cab was stripped and a small filter found blocked. This was cleaned and the valve returned to the loco. 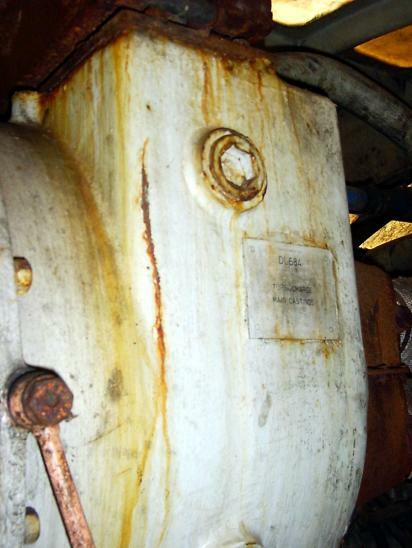 Also on this date the vacuum release valve in the cab was removed and a temporary valve was put in it’s place, as the lever had become detached! (A Different driver from the one who broke the horn lever in cab). This was repaired during the week and put back on the loco the following Sunday. The loco worked well over the gala weekend of the 6th & 7th. On Sunday 21st November the loco had it’s air filters changed and a weeping coolant joint on the engine renewed, also a joint under one of the turbo’s was repaired. This was not a success as it still dripped! After some fighting with the pipe work in this area the pipe in question was removed so the end could be cleaned up. With this done, Saturday 27th saw the pipe re-fitted. Mileage for the year is about 640 miles. 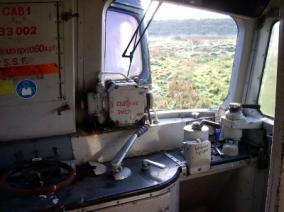 At the start of October the loco had it’s brake adjuster freed and greased. On the 24th the loco had a trip up the line to change some coaches over. Tuesday 26th had the loco in action once again as steam loco 1420 failed with a split pipe in it’s smoke box. The 12.15 departed 10 minutes late, on the return a fresh steam loco was ready to take over. It worked over the gala weekend 6th & 7th without fault. The loco was drained of coolant the following Sunday. Top & tail steam and diesel on Friday 17th December for a wedding reception made the mileage about 540 miles. After this the loco took over from 8110 on the shunt releasing duties until Thursday 23rd when after the last shunt the loco was drain of coolant. On Thursday 30th a start on dismantling the power unit was made with the exhaust system and the charge air delivery pipe coming off, more next time. The new arrival. The fourth and final loco for the S.D.D.T. fleet! For some pictures of the loco, look to the back of this newsletter. Now a look back at the history of the loco & class. An order for the first 45 class 33s was placed in December 1957, with D6500 & D6501 being built in 1959 and classed KA. The slim Hasting line locos being KA-1A. KA locos with reliability modifications became KA-2B. KA-1A (slims) with reliability modifications became KA-3C. KA-3C with slow speed fitted became KA-4C. KA modified for push/pull working became KB. All this changed in time to the following KA & KA-2B to just KA (33/0), KB (33/1) no change, and KA-1A ,3C & 4C changed to KC (33/2). After testing it D6501 was new to 73C Hither Green (London) on 27-2-1960. After a few years it moved to 70D Eastleigh (later EH) where it remained until moving back to London in May 1993 to Stewarts Lane (SL). The loco arrived here on 5-9-1996 Light Diesel from Eastleigh via Woking and was Stored Serviceable. A few days it had to give up its bogies to 33026. The set off 33026 then placed under 002. 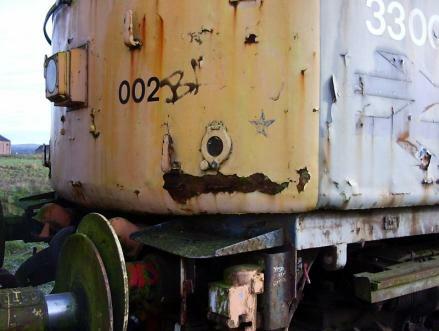 These bogies had shifted tires, which meant 002 went to ‘Stored Unserviceable’. 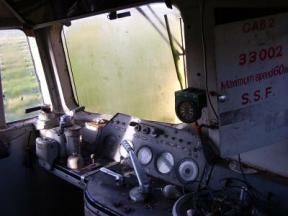 Members of this class worked all manner of trains over the years. 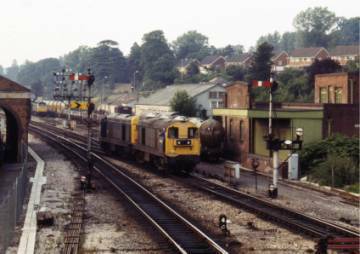 In the West Country after the class 42 ‘Warships’ finished on the Exeter – Waterloo service, the class 33s took over in about 1972. Later they started working stone trains to & from Meldon Quarry near Okehampton, Tank trains from Fawley to Plymouth and Tiverton Jct. After a while they worked trips from Exeter Riverside Yd to Newton Abbot & Heathfield and stopping passenger trains to Paignton & Barnstaple. 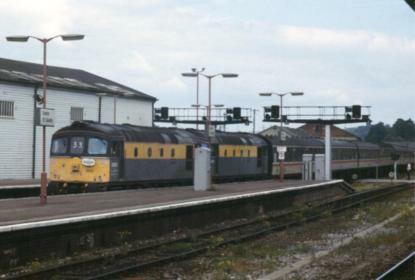 Even after the class was replaced on the Exeter – Waterloo services by class 50s they still showed up assisting failed locos and standing in until a class 50 (or 47) could be found. 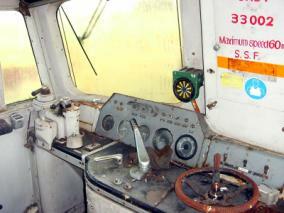 The last passenger working for 33002 was a railtour from Birmingham to Penzance. The two locos coming on at Gloucester (33019 being the other) and back to Bristol. With 33002 leading to Penzance on “The Penzance Flyer” 1Z33 Saturday 22-6-1996. Going against it’s restriction of ‘Buckfastleigh Yard use only’ the loco went down the line light engine after a spell of bad weather (at the end of October) to check for damage, downed trees etc. The loco was running on both Gala days. It is now drained of coolant for the winter. 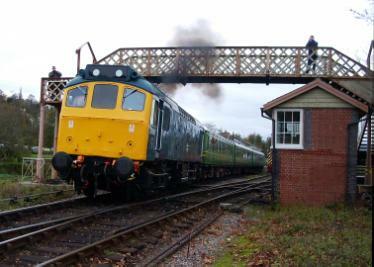 After a spell on the charger on Sunday 31st October an attempt was made to start the loco. It would not start!! All that would happen was the starting motor would spin before engaging in the ring-gear on the flywheel!!! 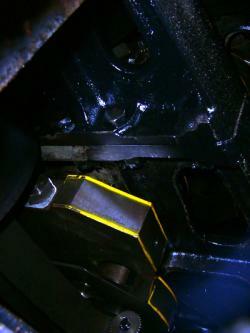 It has since been found that the starting motor has a clutch type device, which is slipping. Whilst at the railway the loco has run about 177 miles. The No. 1 end nose has had the welding finished. With this done both sets of side window were re-fitted with some new wood around the frames and the cab interior rebuilt ready for the November Gala weekend. The loco ran for the last time in it’s old grey livery on this Gala weekend (with green primer on one nose). On the Sunday it was thought that a wild animal had escaped from the rare breeds centre at Totnes as a driver on this loco reported seeing a gorilla in the mist! The loco ended up in the stock shed were a start on the No. 2 end cab restoration and rust removal has started. By the end of December the cab was starting to come back together and most of the welding done. The large saloon lights had been re-fitted by mid-October. Work is progressing with the beading, with the large window frames now re-built and fitted. Work on the saloon doors has had the old paint stripped off and rubbed down. The coming summer should see the large saloon cleaned out ready for the laying of the new lino. The wheel set change is still waiting to happen! 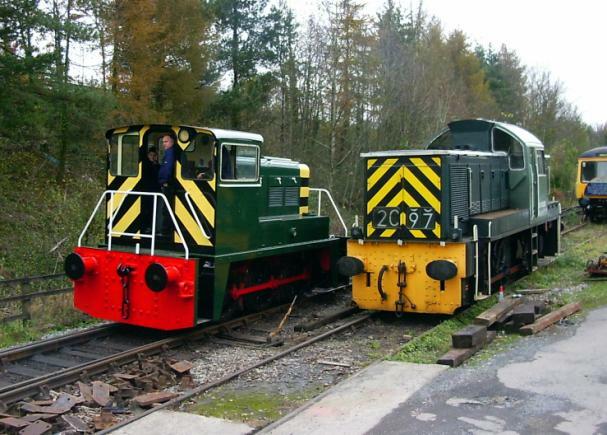 The unit ran on two engines on the Saturday of the Gala weekend, doing three round trips. 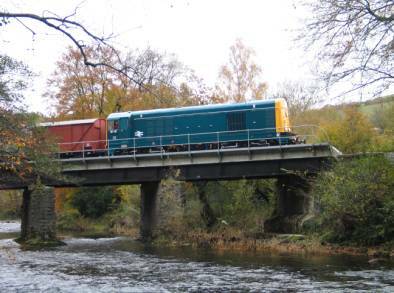 On the Sunday it was dragged around and ended up stabled at Bishops Bridge, Staverton for the winter. It has now been drained of coolant for the winter. In service. Receiving a fresh coat of paint, at the end of October and now looks more like a class 02. LEFT. 20184/169 working the ‘Devonshire Dart’ railtour on 8-7-84. The 20’s worked from Birmingham and were the first of their type to Plymouth. They worked back from Plymouth to Meldon Quarry. Seen here running around their train at Exeter St.Davids (from Middle box). RIGHT. 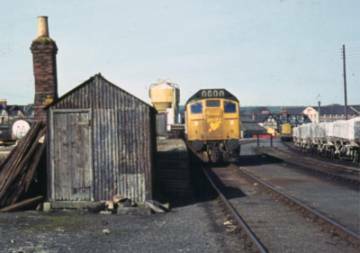 25225 waits between shunting duties in the yard at Barnstaple, mid 70’s. 8110 on show for the first time in it’s new blue livery. The local trip retuning to Newton Abbot with sugar beet empties! If only. The Friday Before the Gala and a grand loco shunt taking place, Arry. True blue 8110/25910 arriving into the loop at Bishops Bridge. 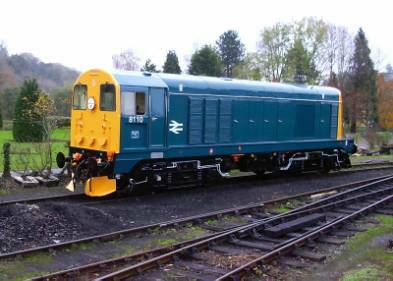 The new look Yorkie on the driver experience runs on the Saturday of the gala with D9525 on show. 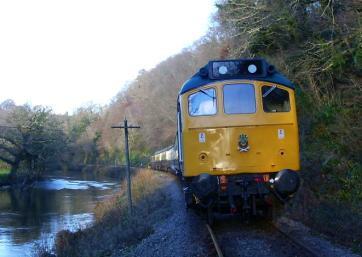 20118/8110 departing Buckfastleigh over the November gala. 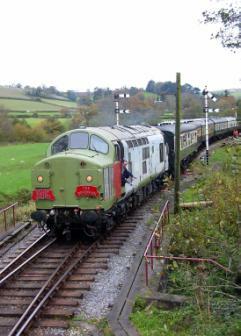 37037 at Bishops Bridge and 25901 powering away from Buckfastleigh with a unit drag. The wedding train waiting at Woodville in the evening sun, just! 33002/019 Arriving at Exeter St.Davids with “The Penzance Flyer” 1Z33 Birmingham New St to Birmingham New St Via Penzance on 22-6-96. The 33’s worked from Gloucester to Penzance then back to Bristol. This was the last passenger train that 33002 worked before being stored a few months later. The driver’s side cab door has the drop light window broken. 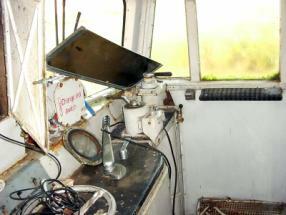 Both cabs have the secondman’s windscreen missing and the seats were all removed at some time whilst up north! Apart from this the cabs are complete and need a good clean. The worst end for rust seams to be No.2 end. Inside the power unit & all found rust free. The turbo has a nice 6 to 8 inch crack in the water jacket but the good news is that the turbine spins around very nicely.